As an Indianapolis swimming pool contractor, I find that all of our customers ponder this very important question: What is the right swimming pool for me? Size, shape, depth, and type are all important choices. Hopefully, this article will help you. While I wish I could tell you what you want, I can’t. I can’t tell you if you want a large pool, a deep pool, or a diving pool. I can’t tell you whether the pool should have shape and design or be a rectangle or whether it should be vinyl liner, fiberglass or concrete. After spending a major part of my life in pools and talking to thousands of customers, I only know that there are no pat answers. But if you answer a few questions, I could probably guess what you will end up wanting 80% of the time! What size do you want and how deep? Do you have 4 teenage boys that are driving your decision? Well maybe a big, deep diving pool is what you want. Do you intend to have lots of big family and friend gatherings or just want a lot of room? Maybe you have a large space that you want to fill up? Well, that points to a big pool but not necessarily a deep pool—a pool that is 3-6’ deep means a bigger shallow end, is more social for adults, and means it’s easier for games like volley ball and basketball. How will you use the pool? Maybe you are not interested in catering to the teenage dynamos and big gatherings…maybe your concept is a nice pool to relax in, sit by, look at and bring family and friends together. Maybe minimizing maintenance is important. If this is you, a giant pool or deep pool is not important. Maybe you should look at pools in the 14x30 to 16x 34 range that are not that deep. This size fits the bill for just about everyone: families and empty nesters; it works as a grandchild magnet; great for games; and is easy to maintain. Do you want a Rectangle or a Shape/Design Pool? Do you want the most square footage for the money? A rectangle pool will give you the most square footage and makes it easy to put on an undertrack auto cover so that no tracks show. These are 2 powerful advantages to a rectangle pool. In addition, utilizing a rectangle pool, you can achieve a lot of design with a great concrete layout, great landscaping and great furniture and perhaps a hardscape feature or two, such as a pergola, outdoor kitchen, or seating wall. Awesome Shapes and Designs; The Auto Cover Tracks. That being said, there is a world of awesome shapes and designs. Does a rectangle seem boring to you? In fiberglass pools, shape and design, as well as benches and ledges come at no extra charge. These features generally cost more in vinyl liner and concrete pools but if you want a big pool with shape and design you will end up with vinyl liner or concrete pool—fiberglass pools only get so big.. And about those auto cover tracks, ask about the various upgrade flush tracks that are available that can hide the auto cover tracks by 70%--many people don’t realize that there are some great upgrade tracks for shape and design pools! 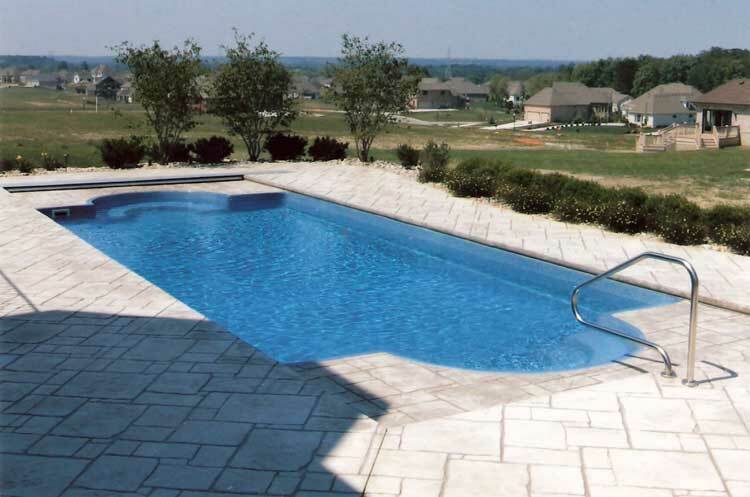 How to choose between a Vinyl liner, fiberglass or concrete pool? All of these pools have their pros and cons and all of them are structurally sound when properly built. To the extent that cost is important, vinyl liner pools are generally the least expensive, fiberglass is midpriced and concrete or gunite pools are generally significantly more expensive. A small fiberglass pool will cost about the same as a similarly sized vinyl liner pool; a medium sized fiberglass pool will cost about $5-7,000 more than a vinyl liner pool of the same size; and a large fiberglass pool (maybe 16x40) will cost about $8-11,000 more than a vinyl liner pool of similar size. Of course, if you want a bigger pool, you can’t buy fiberglass because they really don’t make them much bigger than 16x40. Also, note that the advertised dimensions of fiberglass pools are outside dimensions, subtract about 1 foot for a water edge to water edge dimension (a 16x40 pool is about 15x39 water edge to water edge). So why would you buy a fiberglass pool? There are 3 HUGE reasons. First, they are low maintenance—no liners to replace and no replastering as required with a concrete pool. Second, they are otherwise low maintenance in that they seldom leak while concrete and vinyl liner pools have more opportunities for leaks. Third, if you like shape and design and benches and ledges, these items don’t cost extra with a fiberglass pool but they may cost significantly more on a vinyl liner or concrete pool. These pools are very price competitive in the small and medium sized pools. The major flaw here is their size limitations and cost. Oh, maybe a forth benefit is the look of a fiberglass pool. 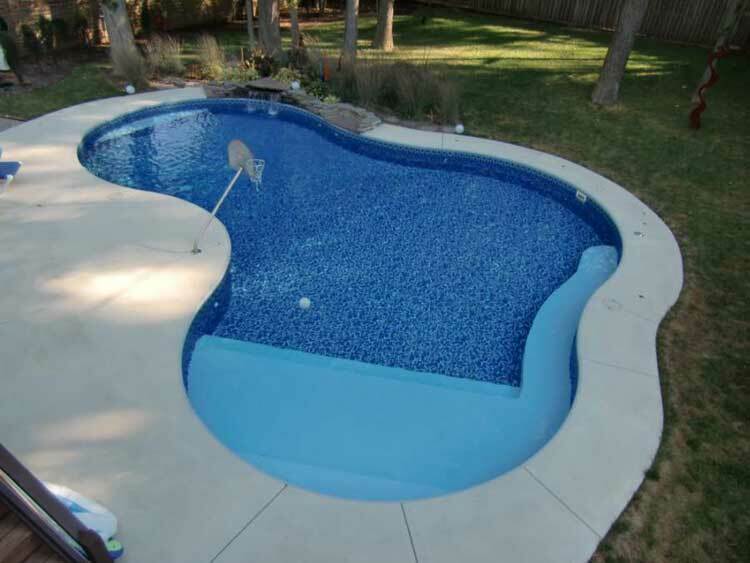 Be sure to check out pictures, you might like the look of a fiberglass pool better! So why would you buy a vinyl liner pool? Again, there are 3 HUGE reasons. First, you can get the exact size and shape you want as these pools are highly customizable and size is not a limitation. Six kids and a big diving pool--no problem. You can't say that with a fiberglass pool. Second, while the liner has to be replaced every 10 years or so, there are 100s of cool patterns and you get a whole new look when you do replace the liner. And while a liner might be more unpredictable than fiberglass or concrete, most of the issues associated with liners are highly controllable. Third, the price is right, especially when it comes to larger pools. A $9-11,000 price advantage can pay for a lot of landscaping and nice furniture! The major flaw here is the unpredictability of the liner. How do you assess, and mitigate against, this risk? It is a manageable risk and only a potential problem. Suffice to it to say that the 60% of pool owners in Indianapolis who have vinyl liner pools are not all idiots and this risk can be significantly reduced. Talk to your pool professional about this issue. So why would you buy a concrete or gunite pool? Here we have a fully customizable pool; no limits at all on shape, design, size, benches or ledges. They look gorgeous when built right! The major flaws here are price (significantly higher) and they are the highest maintenance (a replaster job can cost $7-10,000, concrete and plaster can crack, pok and leak, and algae and stains adhere to concrete while they are generally just brushed off fiberglass or vinyl liner pools). Also, not every pool company in Indianapolis wants to work on them. A warning should come with gunite pools. There is a wide range of prices for these pools in Central Indiana. Why? 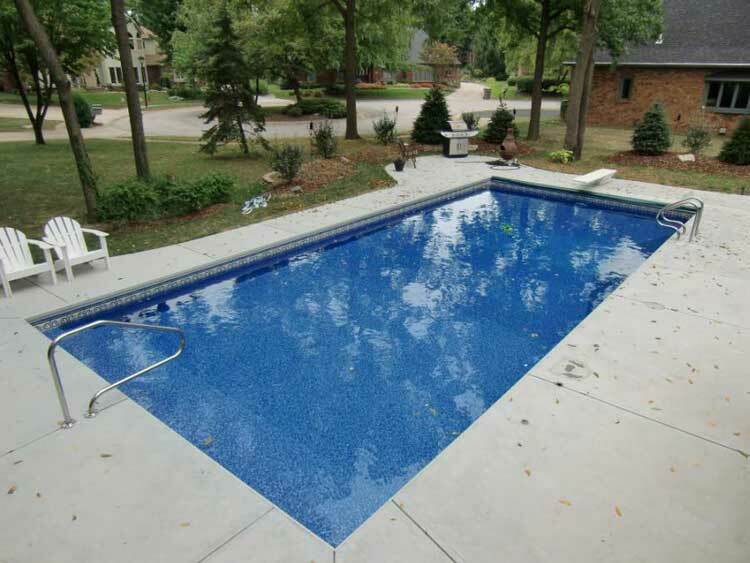 With the lowest price comes a low level of quality and a markedly lesser pool—this is more true in the Central Indiana gunite world than it is for the world of fiberglass and vinyl pools in Central Indiana. Fiberglass shells and vinyl liner pool kits are made in a factory. The gunite pool is a buyer beware world because it is all craftsmanship and everything is made in your backyard so be very sure of your builder. So if you were able to answer the above questions about what pool you wanted, I could quickly narrow your search and move on to other subjects like How Do I Choose the Right Options For Me found in Let's Get Started! Site references--Check out Perma Pools' fiberglass pools and vinyl liner pools.